SAN FRANCISCO, CA--(Marketwire - February 3, 2010) - Cavallo Point -- the Lodge at the Golden Gate announces it has been certified by the U.S. Green Building Council (USGBC) for achieving a LEED® Gold standard for environmentally sustainable design and construction. It is the first national park lodge to receive LEED Certification. In addition, the project, developed and opened in 2008 on the site of Fort Baker, a turn-of-the century military outpost now part of Golden Gate National Recreation Area, is the first hotel on the National Register of Historic Places to be certified and the first new hotel in the San Francisco-Marin area and second in Northern California to achieve LEED Gold status. "This LEED Gold honor is recognition for the incredible efforts of the team who originally envisioned Cavallo Point Lodge as one of the most sustainably developed projects possible," said Ted Lieser, project manager for Equity Community Builders and the Fort Baker Retreat Group LLC, which developed the lodge. "Cavallo Point Lodge was then created through a rare but highly successful public-private-nonprofit partnership between the Fort Baker Retreat Group, the National Park Service and the Golden Gate National Parks Conservancy." The project involved careful rehabilitation of the original historic buildings and interior features, along with a minimal amount of new construction. "Given the guidelines for the rehabilitation of buildings on the National Register, to achieve a LEED Gold certification is a testament to the passion that all of the partners -- the National Park Service, the Golden Gate National Parks Conservancy, and the Fort Baker Retreat Group -- had for preserving the buildings with a high level of sustainability," said Peter Heinemann, principal of Passport Resorts, the hotel management company that oversees the management of Cavallo Point Lodge. "We are very proud that Cavallo Point is the first National Park lodge to receive the LEED Gold certification," said Frank Dean, acting general superintendent of the Golden Gate National Recreation Area. "The National Park Service believes that the reuse and rehabilitation of historic buildings is inherently sustainable. This LEED certification validates our philosophy. The reuse of these turn-of-the-century historic buildings was designed with this certification in mind." The facility is also host to the Institute at the Golden Gate, a program of the National Park Service and Golden Gate National Parks Conservancy addressing key issues of sustainability and the health of the planet. "The LEED Gold certification in a national park highlights the importance of continuing efforts in environmental preservation. The Institute contributes by hosting environmental meetings and summits at Cavallo Point Lodge," said Greg Moore, executive director of the Golden Gate National Parks Conservancy. Cavallo Point Lodge opened in July 2008, and its path toward LEED certification had unique hurdles. The lodge site is a multi-building campus, comprising 34 buildings on 45 acres. Its development involved rehabilitation of century-old Fort Baker buildings and construction of new buildings on the footprint of former, nonhistoric structures. This kind of complex project (number and variety of buildings, size of site) had not been previously examined by the USGBC against their rigorous sustainable building standards. The LEED Gold certification applies to the entire Cavallo Point Lodge project, both historic and new buildings and the overall site. Some of the green building elements considered for the certification include state-of-the-art thin film solar panels integrated into the standing seam metal roofing, low VOC glues, paints and carpets, and green building materials (denim insulation, extensive use of bamboo and recycled woods, and low-E glass, for example). The historic former officer's quarters were carefully rehabilitated, from the original tin ceilings to the ornate mantels. The site's extensive open spaces adjacent to endangered Mission Blue Butterfly habitat were restored with more than 58,000 native plants, all raised from seeds collected from the surrounding parklands. Since opening, the lodge has earned much recognition, including Travel + Leisure Magazine naming it one of the Top 10 New Green American Landmarks in 2008. It also received the Preservation Honor Award from the National Trust for Historic Preservation and two awards from the state of California, the 2009 Governor's Environmental and Economic Leadership Award to the Fort Baker Retreat Group and the Governor's Historic Preservation Award for the project. Set within the Golden Gate National Recreation Area at the north end of the Golden Gate Bridge near Sausalito, Cavallo Point Lodge is San Francisco Bay's first national park lodge. It features elegant accommodations in both historic and contemporary buildings, Michelin-starred Murray Circle restaurant, a Healing Arts Center & Spa, and meeting & event space. The U.S. Green Building Council's Leadership in Energy & Environmental Design (LEED) Green Building Rating System is the leading certification program for the design, construction and operation of green buildings. LEED is a point-based system where building projects satisfy specific green building criteria in six categories: Sustainable Sites, Water Efficiency, Energy & Atmosphere, Materials & Resources, Indoor Environmental Quality and Innovation in Design. The number of points earned determines the level of LEED Certification: Certified, Silver, Gold or Platinum. Cavallo Point Lodge is an environmentally sustainable 'base camp' where the city's urban edge meets the rugged Marin Coast, from which overnight guests can enjoy the expanse of the San Francisco Bay Area and the wine country of Napa and Sonoma. Set within the Golden Gate National Recreation Area at Fort Baker, Cavallo Point Lodge marks a milestone for California and the National Park Service. Fort Baker was added in 2002 to the 75,000-acre Golden Gate National Parks, the largest urban park in the United States. Cavallo Point Lodge signals a new era, one that burnishes Fort Baker's stalwart legacy as it preserves historic buildings, protects the environment and ensures access to the revitalized site for generations to come. 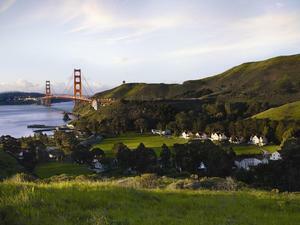 A member of Preferred Hotels® & Resorts, Cavallo Point Lodge was developed by the Fort Baker Retreat Group LLC. Fort Baker Retreat Group is the entity responsible for developing and rehabilitating Cavallo Point Lodge and includes Equity Community Builders LLC, Passport Resorts LLC and Ajax Capital Corp. Passport Resorts or its affiliated companies manage Cavallo Point Lodge, the award-winning Post Ranch Inn, Sea Ranch Lodge and the Jean-Michel Cousteau Fiji Islands Resort. Architectural Energy Corporation and Green Building Services were the LEED consultants for the project. For more information on Cavallo Point Lodge and its programs, visit www.cavallopoint.com or follow it on Facebook or Twitter. The U.S. Green Building Council is the nation's leading coalition of corporations, builders, universities, federal and local agencies, and nonprofit organizations working together to promote buildings that are environmentally responsible, profitable and healthy places to live and work. Greenbuild as well as the LEED® (Leadership in Energy and Environmental Design) Green Building Rating System are projects of the USGBC. For more information on the USGBC, visit www.usgbc.org. Cavallo Point Lodge achieves LEED Gold certification. Image by Michal Venera.